Portland, Oregon drone services company, BD Aerial, was established in 2012 and is a leader in using UAS for media services and to safely inspect and document land and industrial assets. 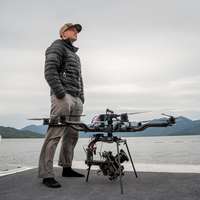 BD Aerial started in the Pacific Northwest and quickly became a preferred UAS service provider across the Nation; Now operating Worldwide with companies like Discovery Channel, National Geographic, and several large construction companies and utility clients. BD Aerial flies payloads including RED Epic, precision LiDAR systems, UV and Infrared sensors, and high resolution cameras for photos, videos and photogrammetry. Using unmanned aircrafts, BD Aerial captures actionable data for surveying high-risk landslide areas and terrain, maintenance inspections, engineering documentation, forestry mapping and construction surveying. BD Aerial is fully compliant with FAA regulations and requirements and has been operating under a 333 exemption for nearly two years and has a blanket COA to operate in all 50 states. Now with the new FAA Part 107 rules, BD Aerial and all of its pilots are licensed with remote pilot certificates.